Original SWAT 1320 Chase 9" Tactical Waterproof Boots FREE SHIPPING! 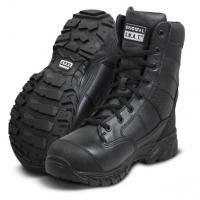 Get the job done with style and comfort wearing the 1320 Chase 9" Tactical Waterproof Boots from Original SWAT. Featuring a classic 9", high-top style, the boots offer optimal foot support and maximum comfort. The sturdy Chase outsole provides a slip-resistant base exceeding the ASTM F489-96 test for slip-resistance, guaranteeing wearers stay on their feet. Designed for tactical all-weather use, the boots employ a waterproof booty and full-grain leather construction to ensure dry feet, regardless of climate. A thermoplastic heel counter anchors the foot to the custom EVA midsole to prevent over-pronation and injured arches. A nylon shank provides increased tensional rigidity for improved agility without the weight of steel. An integrated heel flex-notch offers increased support and protection for the Achilles tendon. ©2002-2019 CopsPlus.com: Original SWAT 1320 Chase 9" Tactical Waterproof Boots FREE SHIPPING!